Events and more to fill that extra hour. Want to start a new program or introduce a new approach to an existing organization to make our young adult community even better? Apply for a Young Adult Community Grant for funding up to $5,000! If your idea connects Jewish young adults and helps them engage with Jewish tradition and culture, we want to help. Applications are accepted until November 30, so get more information and apply today! This is the time of year that a lot of us try to focus on gratitude for what we have and to think about what we can do for others. Make a new gift to the 2018 CJP Annual Campaign today, and an anonymous — and very generous — donor will double it (up to the first $1,000 of ALL new gifts). That’s twice the good we can do. So give today, because this match is only available until November 7! Together, we will feed those who are hungry, include those who feel marginalized, and empower our community to connect with Israel. You do the math, but we’ll give you a hint: it all adds up to feeling good. You may know that CJP is currently searching for our next President and CEO. We regularly update the President Search page on CJP.org to keep you up to date with the hard work of our President Search Committee. You will find everything you need to stay informed, including the Position and Candidate Specification and a wonderful reflection from Shira Goodman, Co-chair of the President Search Committee. If you have any questions or insight about the search, please send them to CJPpresidentsearch@cjp.org. Want to do some tikkun olam as Thanksgiving approaches? Join 75 students and young adults to volunteer with Jewish Community Housing for the Elderly in Brighton and Daily Table, a Dorchester food bank, as part of IACTcares Fall Service Day on Sunday, November 5. Reserve your spot today! CJP’s Young Women’s Philanthropy Fall Event: Painting with a Purpose is coming up on Wednesday, November 15, and we’re excited to be giving back! We’ll paint a mural to brighten up the days of the residents of Jewish Community Housing for the Elderly while we learn more about how CJP supports the vulnerable in our community. Sign up today! Do you work in the medical or healthcare field? Come to the Royal Sonesta in Cambridge for a morning of networking and philanthropy at the Health Professions Annual Breakfast on Sunday, December 3. Our keynote speaker is Brigadier General Tarif Bader, M.D., M.H.A., M.A., Surgeon General of Israel Defense Forces, and he'll discuss "Humanitarian Aid." There's also a pre-reception hosted by the Health Innovations Network. Registration is open, so get your tickets now! Mark your calendar now for Chai in the Hub on Saturday, February 3! Join us as we celebrate the amazing honorees that you nominated, hear from our guest speaker (stay tuned! ), and dance the night away at the party of the year. We’ll share more information in the coming months! Experience Shabbat in a new way at The Break on Saturday, November 4 at Brooklyn Boulders in Somerville with the Jewish Arts Collaborative. Take some time to unplug from the world and climb, meditate, practice yoga, experience VR, make art, drink custom-made Mem Teas, and have meaningful conversations facilitated by Skip the Small Talk. It all finishes with an alternative Havdalah experience that ends Shabbat and could change the way you see “The Break” that comes every week. Join the JCRC’s Israel Collaborative for a two-part workshop on Monday, November 6 and November 13 that will give you the chance to make a brighter future for Israelis and Palestinians. You’ll be part of a grassroots network of young leaders here in Boston to take action in support of Israelis and Palestinians working for mutual recognition, coexistence, and peace. Boston Jewish Film Festival’s FreshFlix Short Film Competition returns on Thursday, November 9 — grab your tickets now! This fantastic event features seven short films (including two with local talent! ), a filmmaker Q&A, and a post-screening party for young professionals. And there are other FreshFlix screenings throughout the festival, so check them out! Keshet and the Consulate General of Israel to New England are bringing Talleen Abu Hanna, Miss Trans Israel 2016 (and the first winner of that crown), to Boston! Come meet her and hear her fascinating story on Monday, November 13. The Northeast Arc and the John F. Kennedy Library Foundation are launching a new competition to bring disruptive, startup thinking to the ways society includes those with disabilities. They intend to give away up to $200,000 in funding this year. While the deadline has passed to sign up for the competition, you can see the amazing ideas people are working on at the Changing Lives through Innovation event on Wednesday, November 15. Learn more and get tickets today. The Ruderman Inclusion Summit is coming up on November 19 and 20, and it’s right here in Boston. The Ruderman Family Foundation believes that inclusion and understanding of all people is essential to a fair and flourishing community. Guided by Jewish values like tikkun olam, they work to advance the inclusion of people with disabilities throughout our society. Come hear more than 50 speakers like Academy Award-winning actress Marlee Matlin over the two days of the Summit, and be a part of making our community — and our world — more welcoming of everyone. Register now. 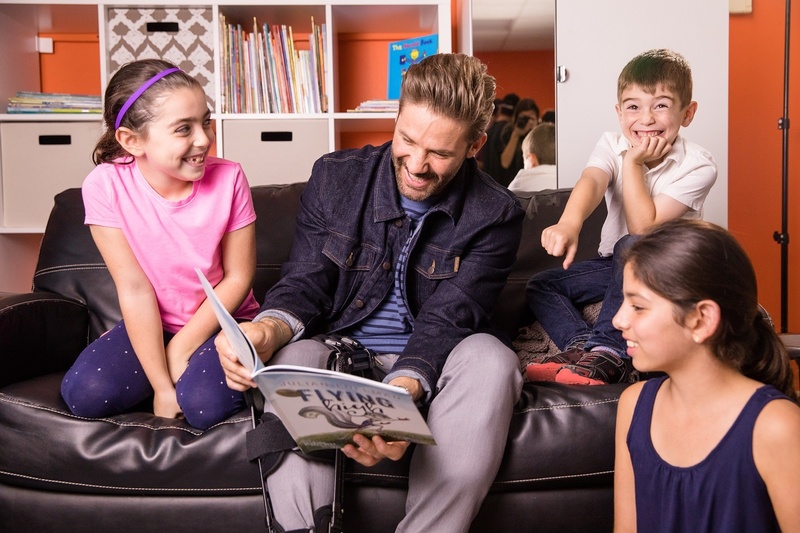 In case we didn’t love him enough already, Julian Edelman read from his new children’s book, Flying High, at the JCCs of Greater Boston on October 10. Read about it, and check out his book! Want to win a free autographed copy of Julian’s children’s book? Download the new israel360 mobile app for iOS for a chance to win one of three books signed by "the squirrel" himself. November 3 | 5:16 p.m.
November 10 | 4:08 p.m.
November 17 | 4:01 p.m.
November 24 | 3:57 p.m.